BROWNSVILLE, Brooklyn (WABC) -- A construction worker is in critical condition following an accident Friday morning at a construction site in Brooklyn. 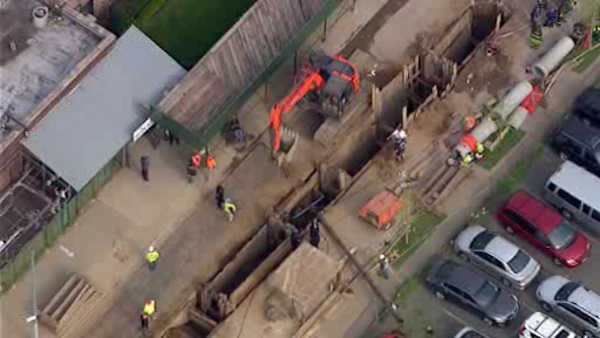 The FDNY says the worker fell into a 15-foot trench at about 8:30 a.m. at a site at East 49th Street and Rutland Road in Brownsville. Rescuers managed to pull him out and he was taken to Kings County Hospital in critical condition. OSHA is investigating the accident. Dr. Brian Yokers, an emergency room doctor at Kingsbrook Jewish Medical Center, rushed to the scene to help the injured worker. He was working in the emergency room when an alert went out over the loudspeaker for an incoming cardiac patient from an accident on 49th Street. When Yokers realized the scene was right around the corner from the hospital, he ran outside and followed the crowd to the trench. The victim was at the bottom of the trench and still breathing when he arrived. Yokers climbed down the ladder to help stabilize him. He held his head to make sure there was no movements so he didn't suffer a spinal injury. When the FDNY arrived, they got the worker in a neck brace and onto a backboard and then into a stokes basket so he could be hoisted out of the trench. The fire department says a construction truck struck a suspended cable line causing a pole to come down, knocking the worker into the 15 foot trench. "To me it's just another day of people are, you know, making a big deal out of it and it's nice, it's nice to feel like people recognize that you are making a difference," said Yoker. "But to me it didn't take an extraordinary amount of courage or effort. I was just doing my job."